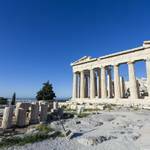 Ancient Greece holds the key to so much of our modern European culture - so don’t you think it’s time to check out the famous sites, legends and heroes for yourself? 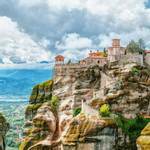 Meteora is unique - a collection of 6 14th-16th century monasteries perched on the summits of volcanic rock pinnacles. No words can really describe this beautiful and bizarre sight so grab your camera, and an empty memory card, as we visit 2 of the best of these wonders on our tour here before travelling south on to Delphi. 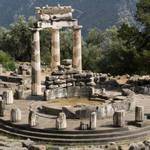 We visit the classic sites of Delphi at the foot of Mount Parnassos with its archaeological site and museum, this was once regarded as the centre of the world. 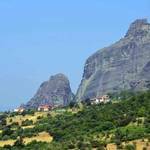 It’s then deeper into the Peloponnese and the village of Tolo. Take the day off to relax or explore the archaeological importance of Olympia. It is here where the first ancient Olympic Games took place and were held to honour the god Zeus. 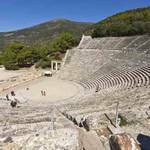 Be sure to see the Ancient Stadium, the temples of Zeus and Hera and the workshop of Phedias. 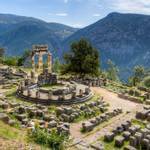 Another day at leisure or we can visit the wonderful deserted Byzantine city of Mystras with its many fine churches. Located just 6km North West of Sparta, we can view the grandeur of this once ancient castle city. 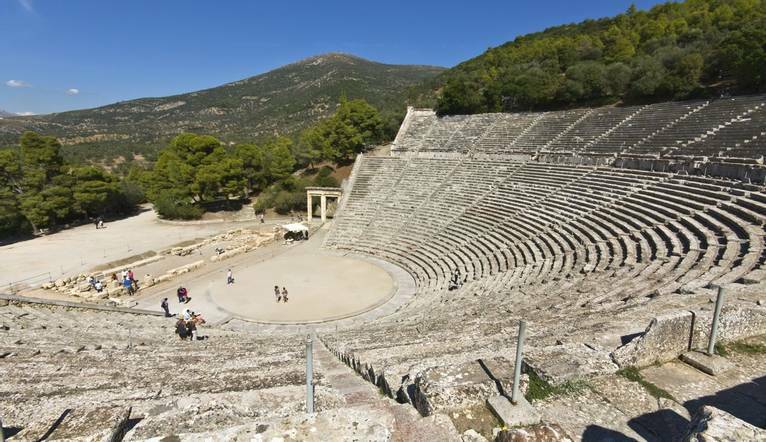 We end our tour with the incredible amphitheatre of Epidaurus and the tomb of Agamemnon at Mycenae. Your head will be buzzing with iconic ancient names and classic Greek myths before we head back to Athens. The transfer time from Athens airport to your the Hotel Stanley is approximately 45 minutes, depending on traffic. You will have the opportunity of visiting different sights and attractions during the course of your tour. Further details will be advised at the welcome meeting. Prices may vary, depending on numbers etc and should be used as a guideline only and can be paid for in local currency only. Your Tour Leader will help organise these for you but may not necessarily accompany you. Your Tour Leader will be on hand to offer advice or suggestions if required but gratuities are offered entirely at the sole discretion of the individual. We suggest a group collection to cover drivers, porters and hotel staff of €15.00. Your Tour Leader will collect this on your behalf and distribute it accordingly, thus relieving you of the burden of who, when and how much to tip. The tipping of housekeeping will be left to your individual discretion (a small amount left in your room on departure should cover this and would be much appreciated). As is customary, ‘the hat’ will be passed around for the driver and guide on all optional excursions. For any meals that are not included in your itinerary, or taxi fares, your Tour Leader can advise of an appropriate % to add on. The emphasis is on smart casual clothes for the evenings and comfortable casual clothes for daytime wear. Appropriate comfortable shoes are a must for sightseeing. Dressing in layers to allow for changes in temperature is recommended, while if you intend to swim, please don’t forget to bring the correct kit with you!